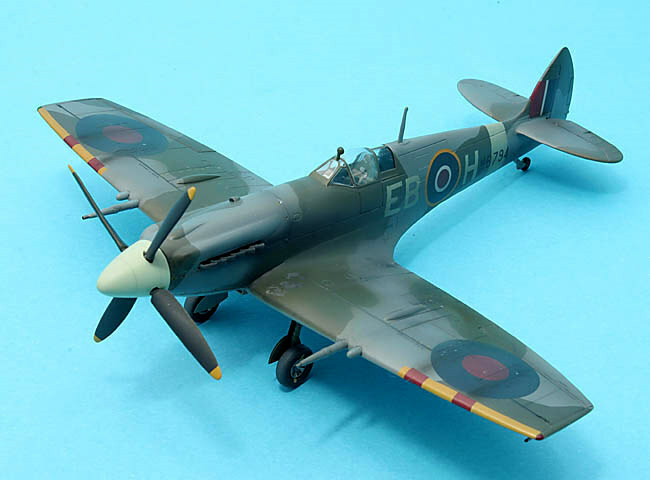 This article is a pictorial review of Xtrakit Spitfire Mk. XII in 1/72 scale, a kit which I have completed recently. 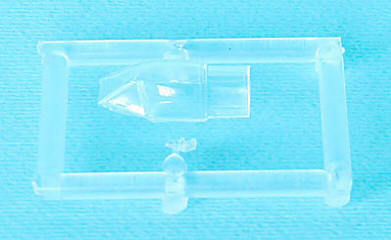 The box contains one sprue of well moulded plastic parts. The major components feature delicate engraving, nice details. A quick inspection of the parts reveals two kinds of wheels, one with ordinary hubs and one with the plain ones that were used on early Spit XIIs. There is also a choice of fixed or retractable tail wheel. 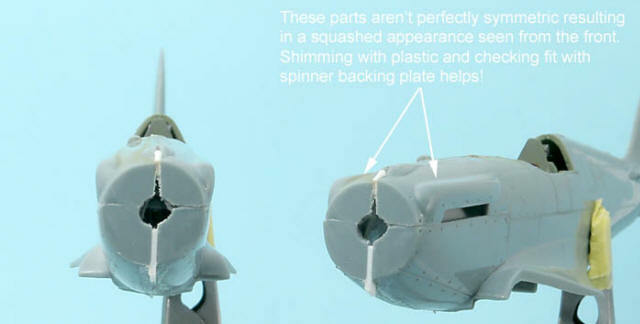 What goes where to which decaling option is clearly pointed out in the instructions. There are also two very oversized teardrop-shaped bulges fitting over the wheel bays. Don’t use them, to my knowledge they were never present on the Mk. XIIs. 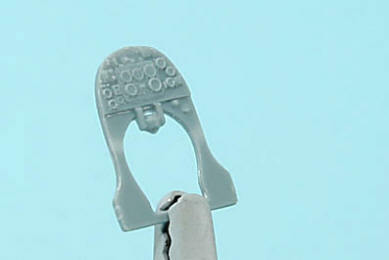 One minor disadvantage is that there is only one canopy in the kit and that one is cast in one piece. 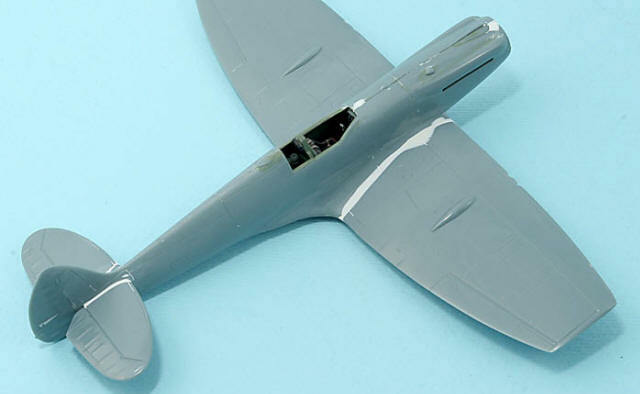 If you would like to do the kit with an open cockpit, you can use the windscreen and the rear glazed part of the fuselage from the kit carefully separating the parts with a razor saw. 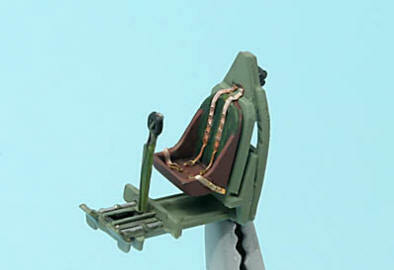 Then substitute the sliding hood with a vac-formed canopy from Falcon. And a decal sheet. 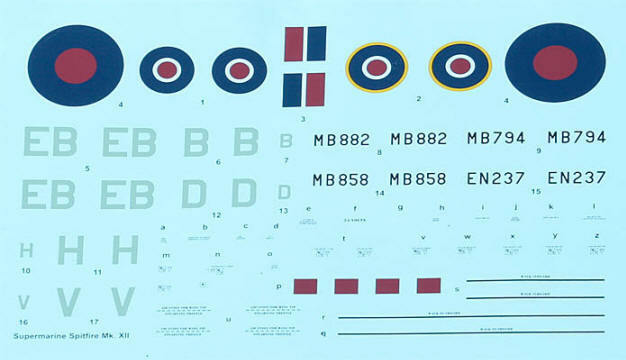 Decals are nicely printed for four different aircraft from No. 41 Squadron. 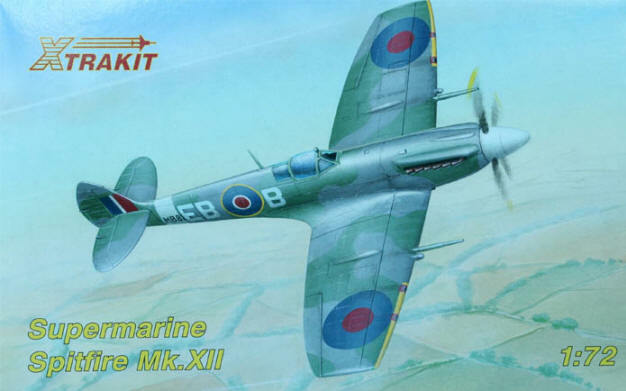 Considering that there were only two squadrons operating this variant of the Spitfire, it’s a pity Xtrakit couldn’t include any markings for a No. 91 Squadron aircraft. 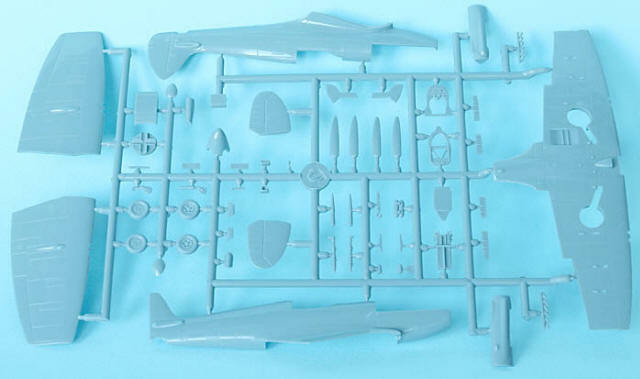 The verdict before assembly is that unlike the earlier Xtrakit Gloster Meteor, this kit was not produced by MPM, but appears to be made by Sword. As for fit: he who lives will see…. Construction starts with the cockpit. Very nicely detailed for being injection-moulded and more than adequate in detail considering the rather miniscule cockpit opening of a Spitfire. I did add seat belts and some other bits and pieces to the interior but I can assure you that none of this can be seen under a closed canopy! I had to make a few adjustments to the nose as per photos below. 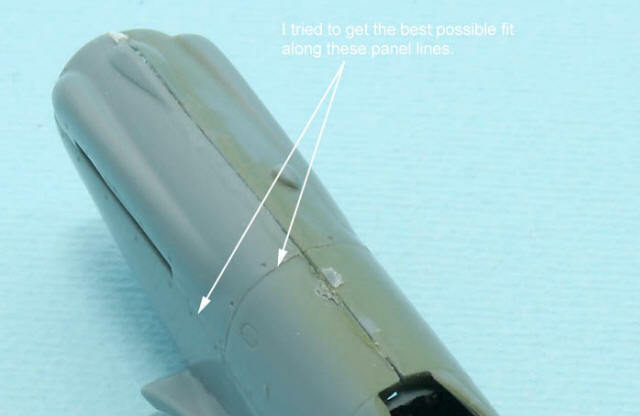 Also, the gap between the fuselage halves was filled with superglue to make sure that it doesn’t crack up or deform later. Attaching the wing to the fuselage requires more filler, I used Milliput. 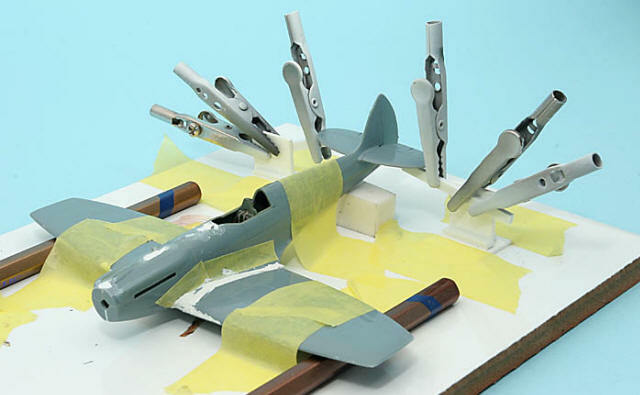 The airframe was jigged using two pencils to get the wings level and the stabilisers attached at right angles. 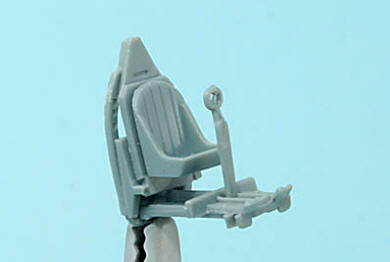 As you can see, I did use a bit of putty both on the wing roots and on the stabiliser joints. I probably would have needed less around the wing roots if I had added a spacer in the fuselage, which I didn’t… The stabiliser joins were pretty hopeless with two contoured edges that should fit together, but their profiles didn’t match… Some filing helps but it far from achieves a perfect fit! nicely done… just one query. My Dad flew a MK12 (shot down over France), and said that it had a five bladed prop. Not sure why that was not also an option following a change. Some pictures I have seen show both variations.